Retroguru will partecipate at the Revision 2019 demoparty (from April 19th to 22nd 2019 in Saarbruecken, Germany. ) presenting at the gamedev compo a port to Lynx of Xump (http://www.retroguru.com/xump/). The game have been developed in the last months with the precious help of many of the member of this forum. After the end of the event the game rom will be freely available on the Retroguru site and , maybe, a phisical release could be available before the end of this year. Judging by your other versions of the game, going to be great! Good work and good luck! necrocia was so kind to reocord the video that will be shown at Revision (we can't use a real lynx to show the game). After the compettion the game, the video and all the screenshots people want, will be available. I'll post something here too. It was fun making the video, the game plays very well. I died many times in the trial runs before making the video too. Some nice puzzles included there! The music and graphics are just great! Looking forward to the game! That red cart looks lovely! Only a week left for Revision 2019. Seems I finished all the last minute change request and the game is under final testing. Today accomplished the task to make the game compatible with both SD cart an Eeprom cart without the need of two separate builds (and obviously it works with emulators without eeprom emulations too). karri says everything works fine, but I'm going to make other test. Do all the testers get their names in the credits? If you want to appear in the game credits, you have to join Retroguru. I am amazed that you manage to port complex games to a large variety of platforms. Do you have any hints for me for OnDuty? How should I code it in case I want retroguru to port the game to other consoles? OnDuty is enjoyable ( I hope ). So it could bring a smile on the face for other console owners. Most of OnDuty is using xml files for defining the scenario, objects and movements. The xml objects are converted into C-structures by a python script. There is only a small C-part that takes care of interacting with the objects. So in theory the pixels are not important, Colours and graphics resolution would easily scale up or down to other platforms. The sounds and music starts from my multitimbral keyboard. I record it into midi files. Print out scores from Rosegarden. Convert it by hand to HandyMusic in order to use lots of loops. Does retroguru use some intermediate "standards" for making things easily portable? For coding the standard language is C, but every other aspect is very free. The main developer of a game can chose to adapt one of the game engine already existing, or write a new one from scratch. I'm coding a new game called Nutmeg and started using the engine of Hermes to have a working POC in couple of weeks, but after 9 months ended rewiting 90% of the existing code to adapt the engine to the game needs. Usually for gfx we use the SDL framework (we can use 1.2 or 2.0), but it's hidden by a layer of proprietary standard functions calls (with a structure very close to that of SDL) so that every platform is free to use the standard mapping to SDL library or link this layer to another library of low levels calls. For 3ds my first ports were done using a fake SDL layer using a mix of direct framebuffer writing and some basic use of the GPU. Later I wrote my own port of SDL 1.2 for the 3ds and started to use it for every other ports. For Xump on 3ds never had the time to convert the initial port to use the 3ds SDL lib. SFX are usually wav samples, while for background music we like mod files (Amiga chiptunes) played with SDL Mixer and LibModplug. This is because most of the members of the team came from the Amiga scene and we have two fantastic chiptunes composers in the team. Obviously for my port of Xump to Lynx I had to oose the portability of the other versions: I kept the main game code, but had to rewrite all the low level code for gfx and sound, and had to change big parts of the game engine to bost the game speed. If the game uses tiled gfx, we have a couple of premade custom tools to design levels. This is not mandatory, but makes it easy asking other member of the team to design levels while you code the game. If you want collaborate with Retroguru, you can contact Shahzad Sahaib (Kojote) and talk with him (I already wrote him about your post anyway). Thanks. 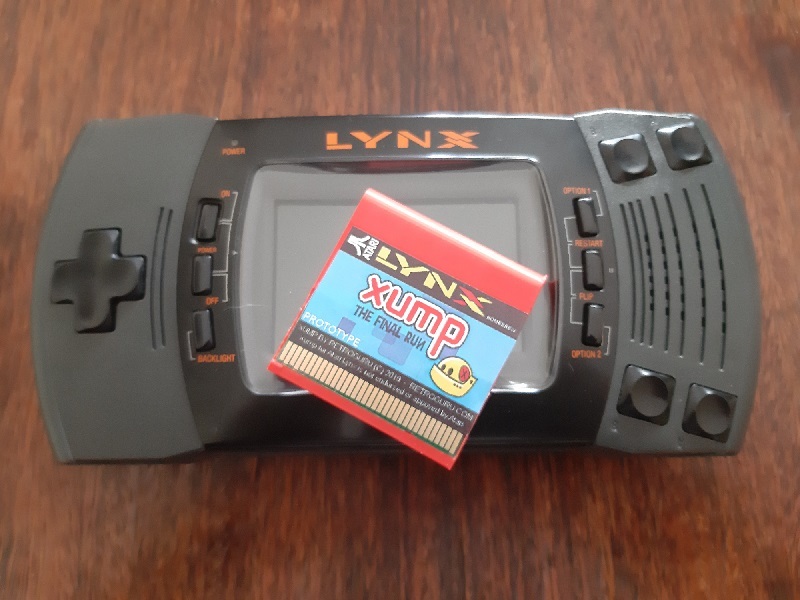 There was actually an effort to record chiptunes directly from the Lynx. I don't really know if the Lynx chiptune player ever saw the light. Edit: silly me. sage demonstrated a player at eJagfest. He also has his badapple demo. I am familiar with SDL layers. For tiled graphics I use "tiled". It is free and pretty fast to use. The big problem for me is always the tiny RAM. I cannot afford to keep any unused garbage in memory. This also means that most compatibility layers need to be compile time abstractions - not callable functions. But I believe that I could ditch the tgi graphics and write an SDL drawing engine instead. SASS is more interesting than a chiptune player as it is a real sound programming toolkit. But it should be possible to write a chiptune player that could stream chiptunes directly from the cart. In a way teaming up would allow to make better graphics, better music, better gameplay. I have to think about it. Edited by karri, Fri Apr 12, 2019 10:55 AM. I think multi system releases are really exciting too! Actually I'm hoping to release the game I'm working on now for a few systems if I can manage. Has anyone on this thread tried out the one used for 8-bit slicks? That one is for 8 bit computers, and the example game is deployed for Atari 800, C64 and Apple II. The SDK looks interesting, I had a quick look some time back. It's based on CC65 which support Lynx, so it may be possible to have it ported to the Lynx too. That would be cool... I'd support that! The author is Anthony Beaucamp. I don't think he is here on AtariAge. I'll send him a link to this thread and suggest he join. I really love the idea of multi platform 8-bit games. I've seen a few online lately (and I'm working on one myself at the moment). One would think that there is a bunch of retro computer enthusiasts that are not "engineers" but tinkerers and artsy types for which this would be ideal. (I would've been in the target audience for a long while as an artsy fartsy type that want abstraction and fairly easy programming, even on these old machines but lately I've also become more interested in some of the technical details of these old beasts). That is truly impressive! With emphasis on complex. I wanted to mention one super fun project I ran into, namely Fabrizio Caruso's "Cross Chase"
it's ported to over a hundred 8-bit platforms! (and some others) Obviously it's not a complex game, but insanely fun idea in my opinion. Game competition is Sunday at 16:00 Central European Time. The event is in live streaming.